This is not what I eat every day, but weekends when I have a little extra time I like to change it up a bit. 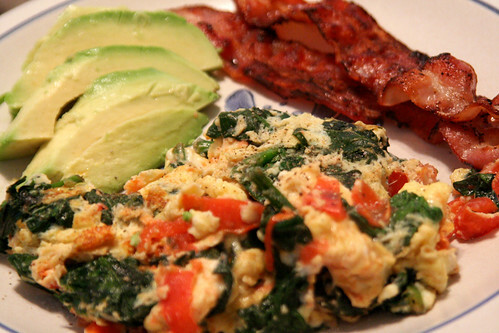 This is two eggs, spinach and tomato omelet, avocado and bacon. This was so delicious!! Now, on to a more important matter. I've been thinking about doing this for a long time, and I don't know what came over me this morning but I just went ahead and did it. I've created a new network for people like me and you that are healing through food. I hope that you'll join and share your story if you've already been healing through diet, or you'll join and share you're story if you're looking for help with dietary changes. This is very exciting for me and I really hope that it takes off!! Tell your friends about it!! yummy -- i LOVE avocado - LOVE IT. i would seriously eat one every day of my life and never get sick of them. that breakfast looks soooo yummy. I actually do eat avocado almost every day! I love it too!!! Avocado is delicious! And it's flavor can be used in any meal, as you have shown. What do you do with the leftover avocado if you don't eat a whole one?